Our formal succession plan was introduced this past Sunday. Are you praying? If you missed Sunday, please watch this video introduction and find out more information here. The Cross Church Board of Directors unanimously recommends Dr. Nick Floyd be voted upon and affirmed by our entire church in all eleven services on our four campuses on Sunday, April 28. You can download a special e-brochure introducing Pastor Nick and his family to you formally, even though some of you have known him for almost thirty-three years. Over the next two weeks, pray for God’s favor and leadership over all these matters. If the Lord permits this to occur, it is my intention and goal to hand over the leadership of this church into the hands of the next Senior Pastor on my final Sunday, May 19. Therefore, the people I have loved, served, and given my life to for the past thirty-two years and seven months will never be without a Senior Pastor. I love you, Cross Church. 16 Services on Our 4 Campuses on April 20-21, Easter Weekend – Who’s Your One? Join Jeana and me in our final Easter Weekend with you as we celebrate the resurrection of Jesus Christ our Lord. After much preparation and prayer, we are now facing Easter Weekend on April 20-21 head-on with great expectation. Focus in on the service options on the campus you attend regularly. MY LIVING HOPE is our theme for the weekend. God is going to meet with us powerfully. We are praying for many to come to Jesus Christ. Because we believe with great conviction that people need Jesus, we are asking each of us to focus in and ask ourselves: Who’s Your One you are inviting and bringing here at Cross Church in one of our services? Several years ago, we had the idea to take Easter into the community by going into businesses and neighborhoods, creating a positive touch about the message of Jesus. This week, there will be over 100 places where our staff team and others will lead short gatherings that proclaim the Easter message in the community, closing with an invite to Cross Church. In most, if not all of the gatherings, people will be given the opportunity to trust Jesus Christ personally. We have seen so many great things happen during the week leading up to Easter weekend. To God be the glory! Please participate in National Day of Prayer observances that will happen all over our region on Thursday, May 2. Find a place to go for this day of prayer for America. 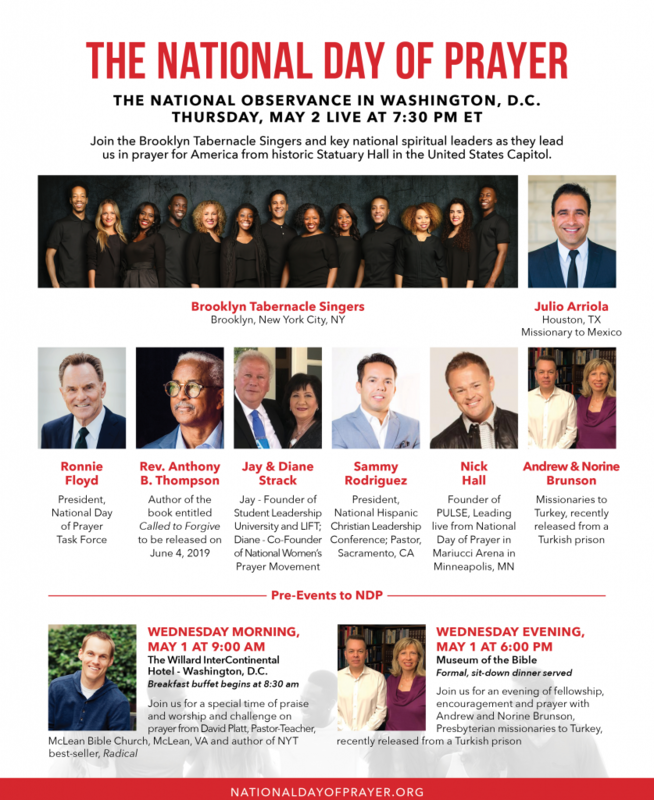 Then join me as I lead the National Observance of the National Day of Prayer from Washington, DC.